Edinburgh Castle is in many ways the spiritual home of Scotland’s proud military past. The honorary post of governor and continued use of the Governor’s House is just one example of this strong link to the past. It is an enduring and historic role that goes back many centuries. Previously the sheriff, keeper or captain would have fulfilled the role as military governor of the castle. Historic sources provide us with the names of governors from the 11th century onwards, though the role and duties have changed over the years and the current position is an honorary title for the General Officer Commanding of Scottish Command. 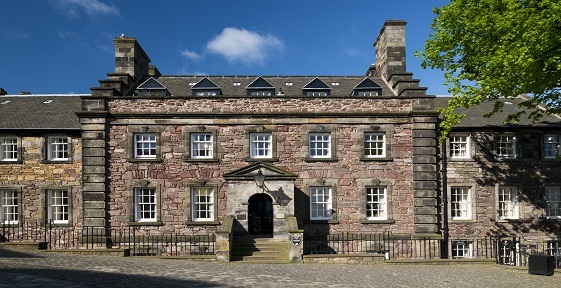 The present Governor’s House was built between 1740 and 1742 and is an outstanding example of Board of Ordnance architecture, designed by Dugal Campbell. The central block provides accommodation for the governor, while the wings were built for the Master Gunner and store keeper. This remains the official residence for the governor until the position lapsed in 1860. The Governor’s home would always have been within the castle. Evidence suggests previous governor’s had accommodation elsewhere in the castle – a 16th century source refers to alterations to the Portcullis Gate to provide accommodation for the captain (or governor) of the castle. Today October 19th, Major General ML Riddell-Webster will be installed as Her Majesty’s Governor of Edinburgh Castle, symbolised by the presentation of the Key of the castle.